Tonight we wanted to hang onto the last bits of summer by grilling so I created my Grilled Sun-Dried Tomato, Olive and Asiago pizza recipe. Last week we had our date night at one of our favorite Italian restaurants, Boccacinis, and I had a pasta dish with an Asiago cheese sauce. It was delicious and it gave me the idea to use Asiago cheese on a pizza. To go with the rich flavor of the Asiago cheese, I bought sun-dried tomatoes marinated in Italian seasonings and oil. 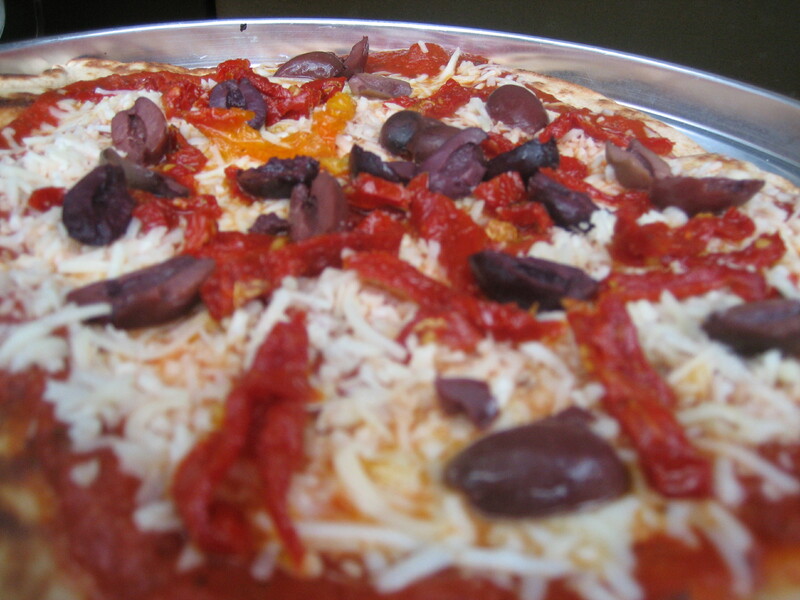 Andrew requested Kalamata olives, which have become a staple in our cupboard, to top the pizza as well. I went with a marinara sauce so it wouldn’t overpower the flavors of the other ingredients. When the grill was hot we assembled the pizza and watched magic happen. The flavors went so well together and this pizza tasted amazing! If I had to compare my Grilled Sun-Dried Tomato, Olive and Asiago pizza recipe with one of similar taste status I would compare it with The Quagliata pizza. Both have strong flavors and surprising tastes, and both turned out to be outstanding pizzas! This entry was posted in asiago, cheese, Fruit, grilled pizza, marinara, olives, sauce, Seasonal, Summer Recipe, sun-dried tomato, vegetarian, veggie and tagged grilled pizza, Grilled Sun-Dried Tomato, Olive and Asiago Cheese Pizza Recipe. Bookmark the permalink.